Why Choose Scrum for Your Product Development? Scrum is an agile process framework (also sometimes referred to as an agile methodology) that has proven to work in project/product development environments that experience rapid change and/or emergent requirements. The complexity in these efforts can result from the domain, number of people involved, compression in time, emergent feedback and more. Scrum is suited for projects that require the combined intellect of more than one individual. The complex problems that are appropriate to tackle with Scrum require the combined focus of a team. Agile processes have been thrust into the limelight by work recently done in the area of software development. Software development is unique due to its potential for rapid feedback loops. Many of these feedback loops can be compressed, allowing learning to take place sooner. This is commonly referred to as inspecting and adapting. Unlike other human efforts, software has been one the fastest models for understanding intense human collaborative efforts. Despite software development being new relative to man’s history on the planet, it has offered us a chance to rapidly learn what works well for intense collaborative efforts. Most of the efforts in software development sit on the boundary between complex to chaotic. The Scrum framework has demonstrated broad applicability to any endeavor of work that lives within the complex to chaotic boundary for a team’s work. 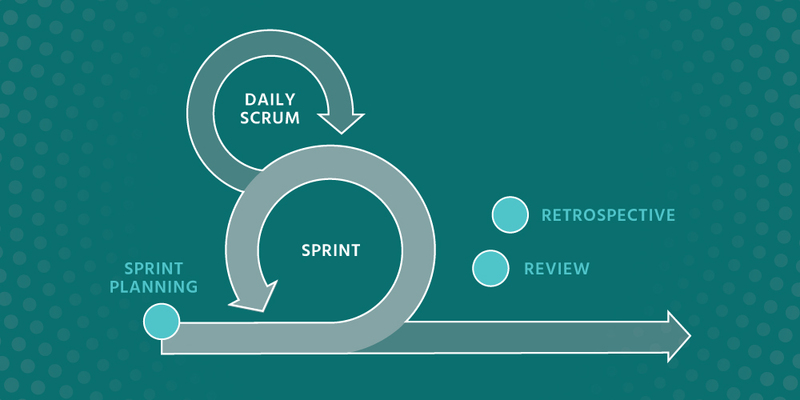 Scrum is a project or product development method that contains short rapid cycles for evolving product. These rapid cycles have enabled software development to move from an area of almost pure art, to creative craft, with well understood engineering practices that support the craft. The same rapid cycles have revealed better ways to tune human collaboration and improve combined effort. As a result, we see the Scrum process and other agile methods being broadly applied to other challenging efforts where complexity reigns. Roles in the Scrum process can be used as a shorthand for understanding the framework. The Scrum framework is for more than just software development. It was born from the need to create software, but is much more about enabling rapid intense human collaboration. Because Scrum enables such rapid feedback, it has proven itself in many domains other than software and has become generally applicable to cognitively intense knowledge work for teams. With Scrum, you can build and then apply the intellectual muscle of a team. When Scrum is applied with care, a well-formed team becomes focused on delivering business value. Scrum is for managing and performing complex work. Scrum is a social agreement to be empirical as a team. The Scrum Process follows Agile’s 2 Big Rules. Scrum challenges us to rethink some of our most vexing organizational problems. One of those problems is performance review systems or compensation models. Classic performance review systems are often not team oriented, but evaluated on an individual’s performance. This is not surprising when you look at the difficulty of accounting for team behavior. The downfall of too much focus on the individual is that we discourage team behavior and it becomes a game of maximizing an individual’s perceived benefit. Designing balanced performance systems for that hit the sweet spot between recognizing individuals vs. teams continues to be a difficult topic. There is no silver bullet formula, but 3Back can help. Contact us to find out which consultations or courses are right for you or your company. Scrum is about humanizing the process so that a team can optimize its pursuit of a goal. It can make your team better and in turn, it can make a better product.